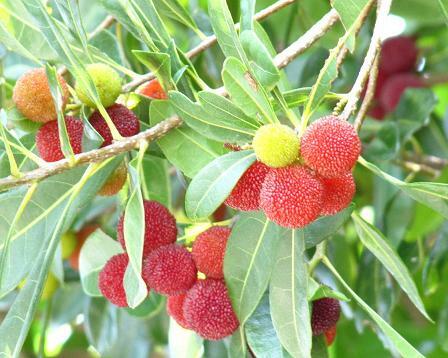 Myrica rubra is called yamamomo. It is a subtropical tree grown for its sweet, crimson to dark purple-red, edible fruit. Its fruit is a sweet-sour delicious. The Japanese name suggests the word peach, but Yamamomo and peach are totally different plant. Yamamoto is a Prefectural flower of Kochi. Yamamomo can grow to a height of 10～20 meters. The leaf is 10 cm,dark green with cortex. It is dioecious, with separate male and female plants. The root system is 5～60 cm deep, with no obvious taproot. The fruit is spherical, 1.5～2 cm in diameter , with a knobby surface. The surface color is typically a deep red, red , it seemed to display small red beads. It matures in July from June. The flesh is sweet and very tart. At the center of the flesh is a big signal seed. It called Morella rubra Loureiro; Myrica rubra var. acuminata Nakai. It is usually cited as Myrica rubra. Yamamomo is a small family of about 30 types. For a long time it was said that family was separated by three genus, and many kinds were classified in the Myrica genus, and Yamamomo was included. Yamamomo is native to eastern Asia, Japan, China. It grows in the warm place and is strong in heat. In Japan, it grows wild in lowland and the mountainous district from Kanto and to the south in Japan. In the south in southern Honshu, it is an important tree class constituting the forest in unproductive land such as the shore or the dry ridge of the low mountain. . It tolerates poor acidic soils, because it lives together with bacteria called franckia performing nitrogen fixation.Therefore it may be used for tree planting. The fruit of the Yamamomo is eaten fresh and is processed into jam and wine. There are two main types of Yamamomo, a sour type used for making dried fruit and a sweet type used for juice and fresh eating. So the bark include a lot of tannin, it may be used as medical use. It might be planted a tree in the fields and moutains. Nowadays it is planted in a park and the street as a roadside tree. How to propagate is by grafting and layering. The main producing center is Tokushima and Kochi in Japan. The seasonal time of Yamamomo is a short period of less than one mouth. So it may be said that Yamamoto is a precious fruit letting you feel the season. If you would like to eat Yamamomo, go to Kochi (or Tokushima!) in the rainy season. I didnt know about this. It is interesting. I want to see it. I like Yamamomo, too ! I want to go mountain to pluck Yamamomo. I ate Yamamomo’s fruits for the first time in Kochi for a few months ago since there is no Yamamomo in my country (which is Vietnam) with some Chinese friends. They said that Japan’s Yamamomo were so cute! Chinese Yamamomo fruits seem to be bigger. Must be because of the difference of climate. I don’t know Yamamomo and peach are totally different plant . I want to see wild Yamamomo in lowland and the mountainous district. It look very delicious. I want to eat it. I understood that yamamomo is not peach.And I thought that I want to eat that. I want to eat Yamamomo’s jam.But I think that it is expensive.I want to look for it and I went to the mountain this time. Thank you for letting me know about good knowledge. I knew that Yamamomo is special product in Kochi,but I do not eat it. I understood Yamamomo is very delicious by your writting.Now it warms very much on summer,when this time,I want to eat it.